I read about composted chicken manure and how good it is for a vegetable garden. 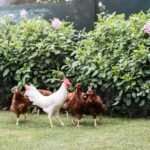 What if my chicken coops are uphill from my vegetable garden? 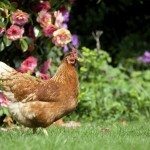 When it rains and the manure is washed down into my garden, will it hurt my garden? No, but you may want to consider putting up some type of barrier.